?Thousands of people from various states of India and abroad gathered at Nagaloka on 17th October at 10.30am to celebrate the 54th anniversary of the Great Mass Conversion to Buddhism by Dr Babasaheb Ambedkar. 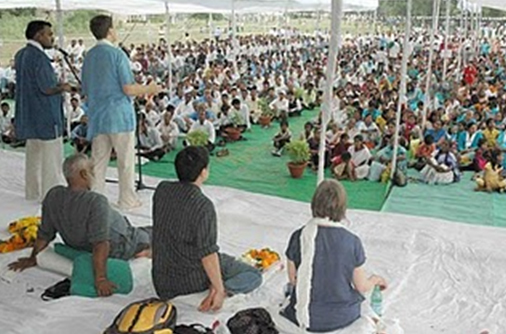 The event was organised by Triratna?s Nagarjuna Training Institute at its beautiful Nagaloka campus. 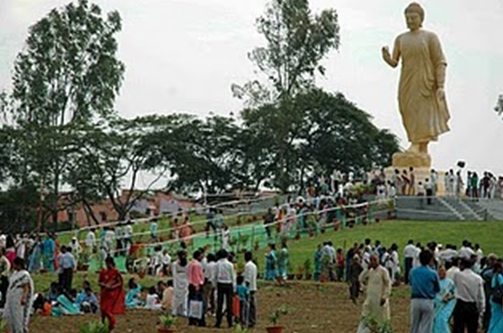 ?For the first time, the celebrations took place adjacent to the 56-foot tall walking Buddha statue, which was inaugurated last December. Harsha Navaratne, President of the Sevalanka Foundation from Sri Lanka, Mr Somboon Chungprampree (Moo) from the International Network of Engaged Buddhists in Thailand and Savi Savarkar, a well-known artist from New Delhi were chief guests on the occasion, and Dharmachari Lokamitra presided over the celebration. Vivekaratna gave introduction to the Dharmaduta Training Course at the Nagarjuna Training Institute and Maitrivir-Nagarjuna from Delhi translated the talks into Hindi. ?A seminar was conducted on the second day on ?the image of the Buddha?., with Manidhamma giving a multimedia presentation on the evolution, history and symbolism of the image of the Buddha and how to appreciate the arts. This was followed by Maitrivir-Nagarjuna gave a talk on Art and Aesthetics in the life of Dr Babasaheb Ambedkar, and Savi Savarkar, who did a presentation on his own art. ?In the beginning guests were welcomed by music and beautiful singing and chanting from Pali. Maitreyanath did the vote of thanks. In the evening all the students and guests visited the Deekshabhoomi and offered their respects to the relics of Dr Babasaheb Ambedkar?.